Ceded tract in Kansas known as "Neutral Lands"
Ceded tract in Kansas known as "Cherokee Strip"
The Cherokee Outlet, as provided in article 2 of the New Echota Treaty, signed in 1835, was given to the Cherokee tribe. It was a seven million acre tract of land beginning east of the Panhandle and extending east to what is now Garfield County and to the southern boundary of what is now Woodward County, bounded on the north by Kansas. It was a sixty mile wide strip from the 96th meridian west to the 100th meridian. It was left unassigned to any tribes in order that all tribes might use it, in connection with the Panhandle, known as “No Man’s Land,” as a thoroughfare on their trips to the Rocky Mountains to hunt. This land was given as an assurance to the Cherokee nation of a perpetual outlet west and a free and unmolested use of all the country west. This treaty required the Cherokees to surrender 8,000,000 acres of their land in Georgia, and a payment of $5,000,000 (about 65 cents and acre). Across the Kansas line, beyond the northern boundary of the OutIet, was a belt of land two and one-half miles wide and laying along the 37th parallel, known as The Cherokee Strip. It was the result of an early survey, which later proved to have been incorrect. The land in the Strip was ceded to United States by the Cherokees after the Civil War. This strip of land was held in trust by the United States for the benefit of the Cherokee Nation. Confusion about the name of the Strip arose in the public mind. 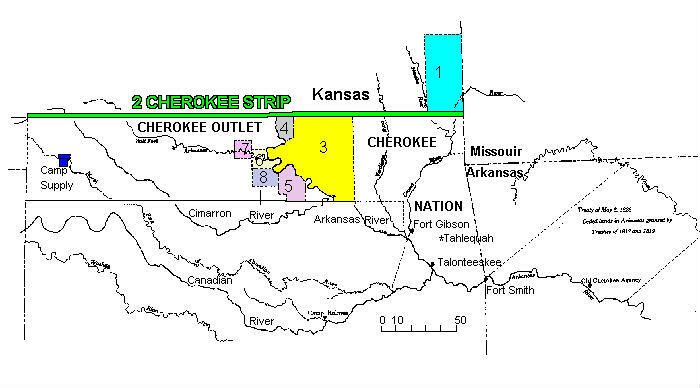 Many people assumed that the Cherokee Strip and the Cherokee Outlet were two names for the same piece of land. Official documents and government land maps, however, show the difference very clearly. Many people, today, continue to misunderstand the meaning of the two names.